Happy Friday! It has been a crazy week around here. Which is pretty standard stuff for the first week after vacation. Unpacking fall clothes, starting school, Emma's birthday, catching up on 3 weeks of missed classes and settling into a new routine all at once is a recipe for chaos. And yet, we have survived! On a positive note, the stink bugs aren't nearly as bad as other years, although, one did climb into the chocolate icing I was making for Emma's birthday cake this morning. That was kind of disturbing. Now, as I look up I see about 20 of those critters crawling on the window above my desk. Maybe I spoke too soon? The exterminator was in yesterday and promises if we can hold out two more weeks we will be in the clear. I am not sure what that means, but I am going to take it as good news. The first day home was cold and rainy, but the last three days have been filled with some fabulous fall weather like you only see here in Maryland. That makes it tough to be indoors doing what I am supposed to be doing instead of outside giving the gardens some much needed attention. And speaking of gardens. The boys picked a bushel of green beans yesterday. We, also, had some home grown roasted beets along side our first pot roast of the season last night. The tomatoes and squash are in a bad way. However, for the first time since we started our little orchard, in 2002, we harvested an apple today. Yes, just one. But you have to start somewhere, right? On the sadder side, our long time fish friend, Jelly Bean, gave up the ghost after living on our kitchen counter for five years. We were all pretty bummed out last night. But we held services today, with Aedan officiating, and buried her next to a tree overlooking the wooded part of our lot. 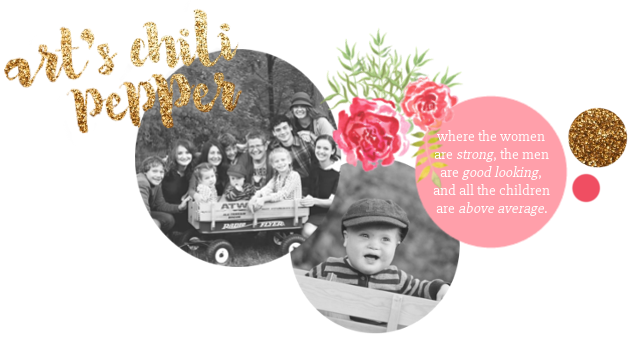 And for those who were wondering, Art's Chili Pepper finished number 8 in the top 25 Large Family Blogs over at Circle of Moms. We will be featured in the Roundup coming up in November. You can read our interview now by clicking here. Brianna has struck again just in time for fall. Over in the kitchen we have been enjoying pumpkin lattes the last few days. They surpass those delectable ones at Starbucks by leaps and bounds. Maybe I can wrangle the recipe out of her sometime soon. And with that, I am off for my coffee break.